My work takes me all over the place, so when I saw that my schedule would take me into Wolfheinrich’s neck of the woods we planned a meeting via Twitter. We went out for ice cream and he brought his lovely new daughter Airy with him! Isn’t she lovely? He changed out her default eyes so she’s wearing some animetic eyes from CoolCat right now. I got to see her lovely face sculpt and her sweet smile in person, and was very impressed with the quality of her outfit (everything is lined with light fabrics). I felt a bit sad that because I really liked her more after seeing her in person, and then Wolfheinrich told me that she was available on the Volks International site as a non-lottery item! Well – that did it! I went back to my hotel and bought her on the spot! 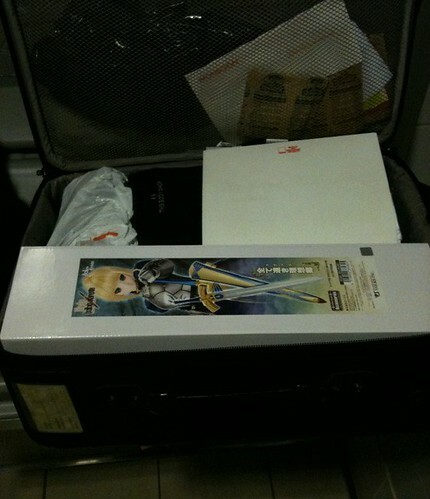 I also purchased Wolfhenrich’s spare Avalon sword for my Saber Lily. I was a bit concerned about how to bring it home, but it turns out it fit nicely in my suitcase! It went through 2 airport x-ray scans and no one batted an eye. Apparently Avalon is not a dangerous weapon ^__~” hehe. Please ignore the mess inside my suitcase >__<“! 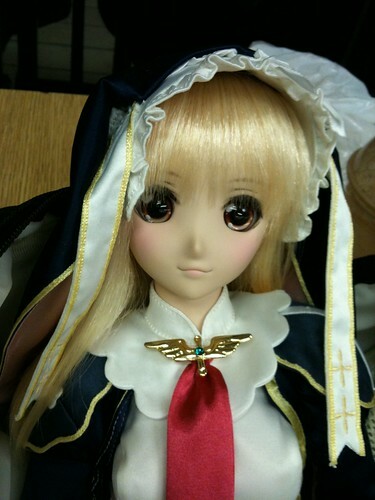 This entry was posted in Dollfie Dream and tagged Airy, Dollfie, Dream, Volks by archangeli. Bookmark the permalink.